Van Blarenberghe, gouache on vellum mounted beneath crystal glass. This second gold snuff box belonging to Choiseul is now in the Metropolitan Museum's Wrightsman Collection. 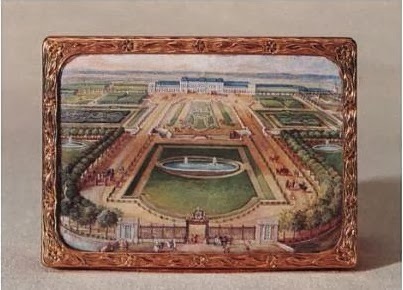 The six miniature views, again by Louis-Nicolas Van Blarenberghe, depict Choiseul's grand château at Chanteloup near Amboise in Touraine. Since almost nothing now remains of the estate, they are an important record of his extensive embellishments to the house, gardens and park. Choiseul employed his architecture Le Camus de Mézières to add long colonnades on either side of the main house linking it to twin pavilions. The gardens were remodelled on several occasions in a mixture of formal and "English" or "Chinese" style. The park was also greatly expanded. 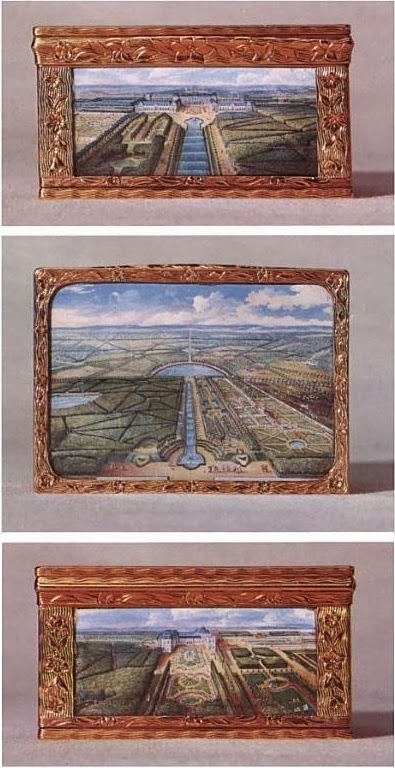 Soon after purchasing the property in 1761 Choiseul acquired the Forest of Amboise by exchange of lands with the king and opened up the series of extensive radiating rides shown on the base of the box (see right, middle picture). This vista of the park with its semi-circular water feature, fed by pipe and canal from twelve kilometres distant, gives some sense of the enormous scale of Choiseul's estate, which it was said to take twenty minutes to cross. Sadly Choiseul's debts too were on a regal scale. 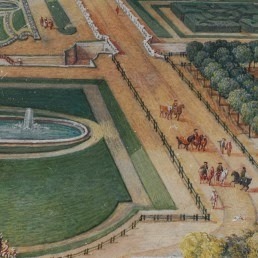 Following his bankruptcy and death, Chanteloup was sold first to the duc de Penthièvre and, in the Napoleonic era, to Jean-Antoine Chaptal, who used the park as a sugar-beat factory. Finally the property fell into the hands of speculators and was entirely demolished.